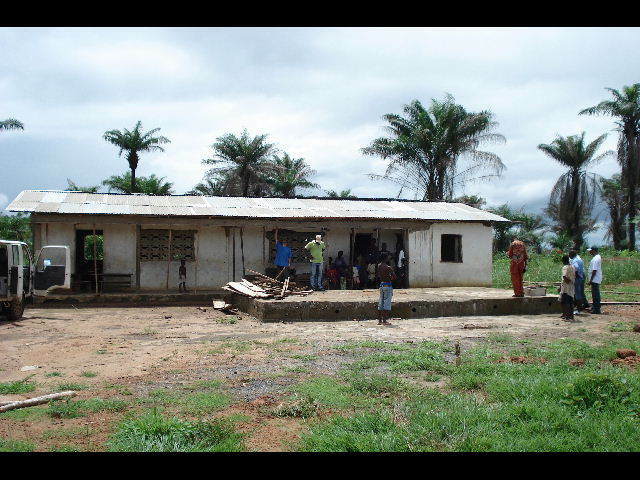 Unfortunately we have had a crime incidence at Mamama causing serious problems for the project-completion. The proposed completion date has passed a while ago. The reason for this delay is a crime, which was committed by one of our contractors. Mr. Abu Bakar Kamara, the mentioned contractor, received all materials necessary for the construction in Mamama and 70 percent of his salary in advance. 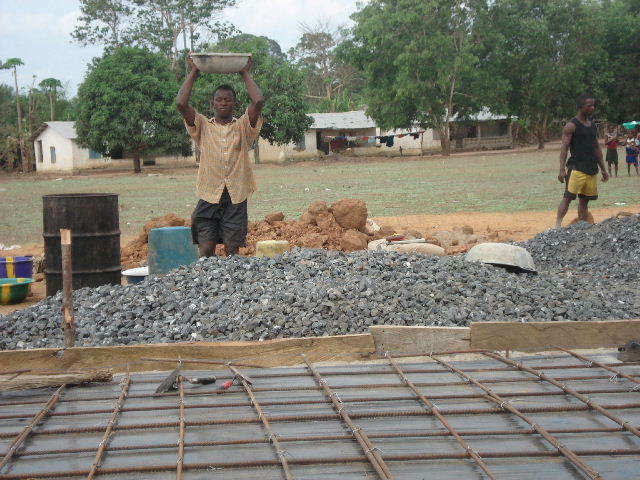 Since our project doesn’t own an appropriate place to store materials, it seemed to be better to supply him all materials at once, so he could store them in the school at the location and work independently. By the time the contractor completed about 70 percent of the construction work he disappeared leaving no materials behind. After that we tried to trace him but unfortunately didn’t succeed. On top of that the contractor worked in a very bad manner, which caused us to redo some of the work, which has already been done. Thereby material and personnel cost increased again. Seeing ourselves responsible for those happenings, our staff didn’t receive any salaries for eight months to be able to cover the losses and the extra cost. Unfortunately the money gathered by that, wasn’t sufficient to pay to complete the construction. With an extraordinary support from Austria just before Christmas, we have been able to at least pay our staff five months salaries back. This was absolutely necessary as the situation turned out quite bad for our staff members at this time. Until now we haven’t been able to raise enough money from other sources to complete the tanks. Most likely we will not be able to cover for all the losses. The construction status is as following: The cover of the tank has not been constructed yet, as the construction materials and the pump were stolen. The collectors are there and can be fixed as soon as the tank is completed. To be able to complete all constructions involved in the project we would need an additional fund of 3,237.93 US-Dollar. We deeply regret to be in a position right now, where we have to ask for additional funds again. But without your help, I am afraid we will not be able to complete the project in the foreseeable future. Of course we will continue to do our best to complete the construction. We hope that we will find a way to overcome these difficulties together. The construction of the Rainwater harvesting tank at the R.C Primary School in Mamama has been completed and properly cleaned. Harvesting of rainwater is in progress. The beneficiaries have also benefited from the Hygiene and Sanitation practices training organized by the Safer Future Youth Development Project’s WATSAN team. The tank has already been handed over to the school committee of the Mamama community for its proper utilization after the rains. Chlorination of water will be done as soon as harvesting is completed. The tank at The Church of God Of Prophecy Primary School in Makandeh has been completed but still awaits the repairs of the school ‘s roof which is badly damaged by the heavy storms also affected the building which was locally built with mud blocks. Frantic effort has been made to solicit funds for the proper reconstruction of the entire building but to no avail. 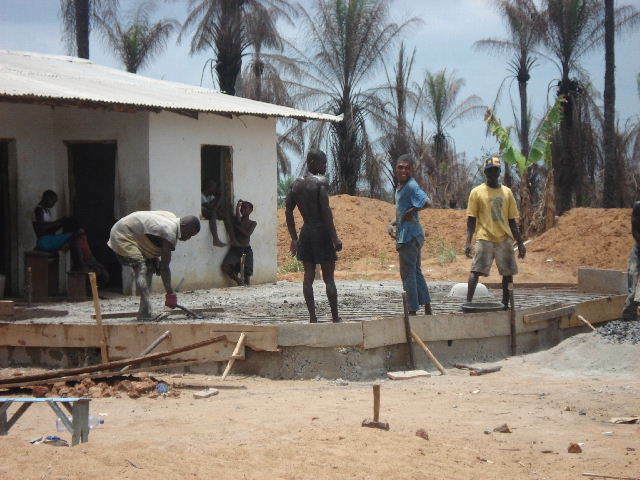 As soon as the funds to complete the project reached our account we started immediately to further the construction, so that the tanks can at least store a little water, from the ending rainy-season. 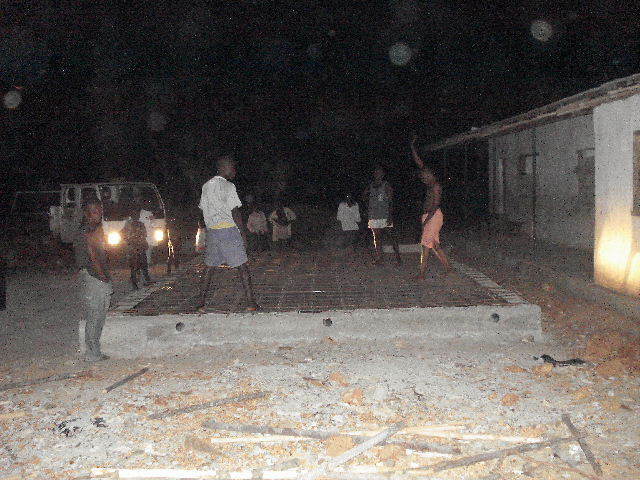 The roof has been fully constructed, the filtering tank has been built, the collectors fixed and connected. The tank is already gathering rainwater. The pumphead has not yet been fixed as the inside of the tank has to be cleaned properly first. The tank in Makande is fully functional, but unfortunately the community has yet not been able to raise funds to fix the broken roof. As we want to see the tank being used we are trying to find other sources to fix the roof. At the moment we are discussing the issue with UNICEF Sierra Leone. We might be able to include the renovation of this school in a future project. Yet nothing has been confirmed though. Please take a look at the uploaded pictures. The proposed completion date has passed a while ago. The reason for this delay is a crime which was committed by one of our contractors. Mr. Abu Bakar Kamara, the mentioned contractor, received all materials necessary for the construction in Mamama and 70 percent of his salary in advance. Since our project doesn’t own an appropriate place to store materials, it seemed to be better to supply him all materials at once, so he could store them in the school at the location and work independently. By the time the contractor completed about 70 percent of the construction work he disappeared leaving no materials behind. After that we tried to trace him but unfortunately didn’t succeed. On top of that the contractor worked in a very bad manner, which caused us to redo some of the work which has already been done. Thereby material and personnel cost increased again. Seeing ourselves responsible for those happenings, our staff didn’t receive any salaries for eight months to be able to cover the losses and the extra cost. Unfortunately the money gathered by that, wasn’t sufficient to pay to complete the construction. With an extraordinary support from Austria just before Christmas, we have been able to at least pay our staff five months salaries back. This was absolutely necessary as the situation turned out quite bad for our staff members at this time. Until now we haven’t been able to raise enough money from other sources to complete the tanks. Therefore we now have to admit, that we will not be able to cover for all the losses. The tank is completed and the pump is installed. The collectors are there, but couldn’t be fixed yet, as the roof of the school wasn’t repaired by the community completely so far. The cover of the tank has not been constructed yet, as the construction materials and the pump were stolen. The collectors are there and can be fixed as soon as the tank is completed. We deeply regret to be in a position right now, where we have to ask for support again. But otherwise we will not be able to complete the project in the foreseeable future. At the time we started work we were supposed to build a 100.000 litres tank. But with the problems faced at Ferry Banda Sirma occurred, we decided to enlarge it to a 150.000 tank without hesitation. The community was so cooperative and much more interested in the utilisation of RHT, even involving a neighboring community. Additionally the number of students increased since our first survey. Sorry for not reaching you with this information more early but be rest assured that the big communities of Magbontoso and Mile 38 will utilise the tank properly. The 100.000 litres tank was not roofed yet. We reached a status where the tank will not be damaged by the rain and can be finished after the rains. This was not planned but as the project was started middle of March the time was too small. Roof taken off by the breeze!! The 100.000 litres tank is completed. The only and major problem now, is that the roof of the schohol was taken off by the breeze! Thanks to god we have not installed the pipe system at that time. We have no idea when the school will be able to raise enough funds to rebuild the roof. We will keep you informed about this issue. 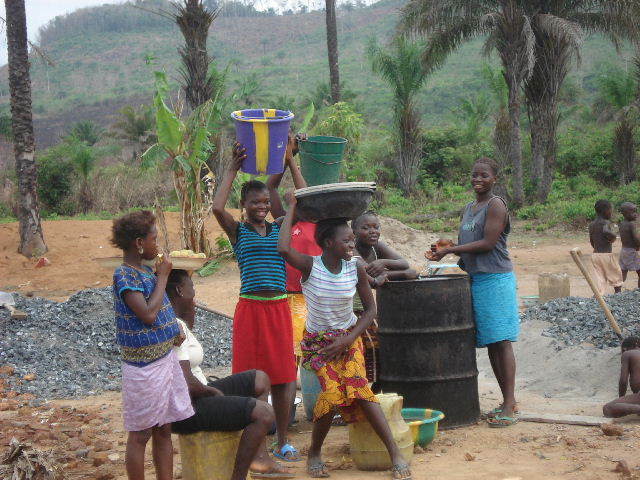 Community-Members: USD 0.07 (Le200) for each bucket of Water. Maintenance that could be done: cleaning of the tank, Chlorination, Replacement of water collectors,etc. This proposal was meant for three school located in Mamama, Makande and Magbontoso, all proposed to have 100,000 liters each. 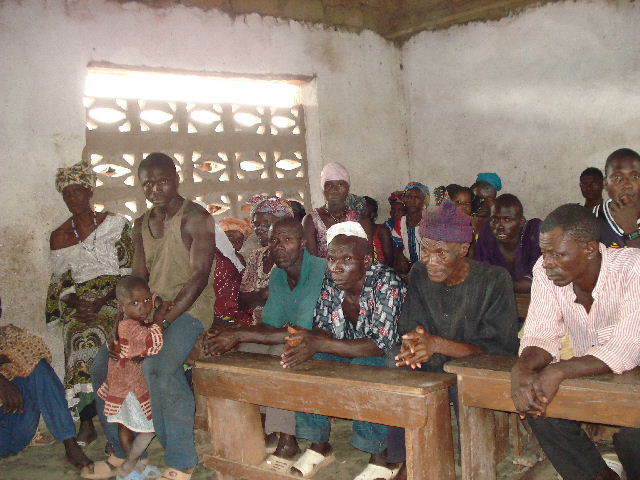 However Magbontoso/Mile 38 increased to 150,000 liters as it is serving two villages with large populations. That is why we have put a project description on it's own for this tank online. When watching the pictures you will see that the tank at Makande is almost complete. What is left is only to fix the water collectors. As the roof of the school was blown off by heavy wind during the rainy season, we have constraints to install the collectors because the school does not have the money to fix the roof properly. At the construction site in Mamama we were facing serious problems which are explained in more detail in the narrative. From a survey conducted, a total of 1314 people will now benefit from the completed RWH tank which will produce 200,000 litres(100,000 litres in each of the tanks). During the school's survey, a total of 664 school children and 8 teachers were recorded to benefit from the rainwater harvested in the tanks. 8 teachers, 70 household heads and 664 school children benefiting on water, sanitation and hygiene practices.